Vicky Paeschel, 27 from Sheffield is taking part in the city’s Big Fun Run at Rother Valley Country Park this August, as part of the ambitious challenge she has set herself to raise an incredible £10,000 for the MND Association in memory of her beloved mum. 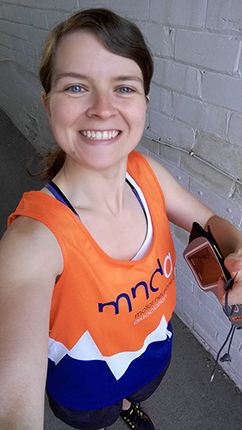 Vicky admits she has never considered herself a runner but will be running for those who can’t, competing in a series of runs and walks across the UK covering a total distance of at least 100km, to help people affected by Motor Neurone Disease (MND), their families and carers. Vicky’s personal experiences with MND have inspired her to become a dedicated fundraiser and volunteer for MNDA, a charity dedicated to improving care and support for people affected by MND, a fatal, rapidly progressive disease that affects the brain and spinal cords, attacking the nerves that control movement so muscles no longer work. After bravely battling her illness with incredible strength, Vicky’s mum sadly passed away in November 2008, at the age of 39, after a 9 month battle with Motor Neurone Disease. Vicky explains: “My mum was the most generous, kind, compassionate and loving person. She was incredibly creative, loved to laugh and taught me that the happiest individuals in the world are those who put other people first, which is exactly what she did as a mother – always putting her 6 children first. Losing my mum has been devastating but I have since lived my life to make her proud and help others affected by this cruel disease”. Having spent the last year getting physically fit, Vicky joined the gym and began exercising 4 times a week and lost 40lbs in the process. She completed her first ever race last June and Big Fun Run will be a very special event for her as she will be completing her “100km for MDNA” challenge she has set herself when she crosses the Big Fun Run finish line. Reflecting on her amazing achievements, Vicky explains: “I have so far raised over £3,000. I will continue running to raise much-needed funds for the MND Association and awareness of MND as there is ‘No Finish Line Until There is a Cure!’ so that one day many families will not have to go through what we had to experience. To support Vicky and this very worthy cause visit: https://www.justgiving.com/fundraising/100k-for-MNDA or text TYVM89 £5 to 70070. To find out more about the Motor Neurone Disease (MND) Association click here.